In Week One of our Organized Life Series, our goal is to create calendars and schedules for cleaning & maintenance and to develop a weekly schedule. If you don’t already have a cleaning list for your home, you can view my Cleaning Chores article. I’ve also attached a Microsoft Word document containing all of the information on that page. Feel free to download it and change it to match your needs. If you add or remove items, make sure you adjust the estimated times. You can download the document to avoid reading the article. Once you’ve determined what your needs are, you can plan the schedule. Organize your cleaning list by time instead of by room. In other words, section Every Day, Every Week, Every Month, Every Season, Every Year. Print out a blank calendar for some work space. The easiest way to do this is to open Microsoft Word (or your substitute) and open a New document. There should be a Calendar template. Just do a basic one-month calendar for the current month. To save some trouble, here is a June 2012 Blank Calendar PDF. Using this blank calendar, you can scribble and make plans for your cleaning schedule. Daily: For your daily schedule, Print out something like THIS Daily Schedule and hang it on your bathroom mirror. Weekly: For the weekly cleanings, decide how you’re going to do it. You can do all of it on one day (around 3 1/2 hours), or spread it out through the week. For my example, I’m going to spread it out through the week. The kitchen, bathrooms and bedrooms, entry, and Great Room (family room) have the heaviest use and need cleaned every week. The other rooms such as the office, the spare bedroom, and closets need attention only every two weeks. For me, I’m doing weekly chores on Monday, Tuesday, Thursday, Saturday and Sunday. Monthly: Once again you have an option. You can do all your monthly cleaning in one day or spread it out during the month. Again, I prefer to spread it out. Additionally, I like to put my extra cleaning in the Kitchen on a Weekly kitchen day. I’ve attached a June 2012 Filled Calendar as an example. Rotational Deep Clean: The beauty of this plan is that you do about 2 hours once a month so that you don’t have to do a bunch of spring cleaning once or twice a year. This doesn’t go on the monthly calendar, but will need to be placed on your digital calendar. Yearly: These items can go on your cleaning calendar or can be placed on the maintenance calendar below. Again, you have some options depending on your preference. If you like a paper calendar, go into Word and fill in the calendar with your dates. The advantage to this type of system is that you can hang it on the refrigerator or somewhere to have a visual reminder and the satisfaction of checking off items when they are complete. Or you can enter the data into your phone, computer, or internet calendar. The advantage to those systems is that you can set up reminders. I can’t give recommendations for setting up all digital calendars, but here is how you do Google Calendars. General: To begin, go down to your My Calendars Bar and click on the arrow next to it. From there, Create a New Calendar. Then name your calendar and give it a description. Once you’ve created it, I strongly recommend that you go back into that calendar’s settings and click on “Notifications” to set up reminders. I use the following setting: This means that Google will text my mobile phone at the time that my cleaning event is scheduled. Take note: schedule the cleaning at the time you want to be reminded to do it. Also, if you choose to do Mobile reminders, you should probably have an unlimited text messaging plan on your mobile phone. Otherwise it could get expensive fast. Daily: I don’t recommend you enter daily items. This makes for too many reminders and you will start to ignore them. Monthly: For monthly cleanings, set up the reminder for monthly based on the day of the week. For example, repeats on the 2nd Friday of every month. Again with no end date. Seasonal: Schedule the seasonal cleaning as often as you like. If you choose do to it in the Spring and the Fall you can have it repeat every 6 month or make 2 separate entries each repeating yearly. Yearly: This should repeat yearly. There are two ways to do this. If you repeat yearly, it will only do it on the day of the month. Like July 1 – no matter what day of the week it is. 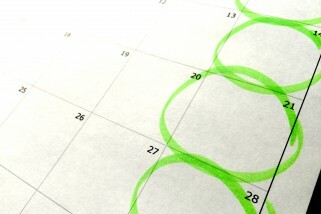 To have it repeat on the First Saturday in June, you need to have it repeat Monthly – every 12 months, on the day of the week. 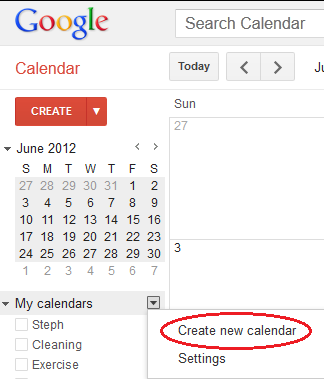 The Google Calendar embedded below will help you keep your cleaning tasks organized. Additionally, with Google Calendars, you can share (read here – delegate) tasks or the entire calendar with your significant other or even your kids. You can subscribe to the calendar below by clicking the +Google Calendar button at the bottom of the widget (or just click this link). If you want to customize the tasks that copy over to your Google Calendar, click any item and copy it to your own Google Calendar by clicking the “copy to my calendar” link (the calendar is embedded in Agenda view so you can more easily view the different tasks), then adjust the dates and times if you wish. If you don’t use Google Calendar, you can download the calendar in various formats from the links below. UPDATE (6/16/2012): I found that receiving daily reminders for all of my chores annoyed me and didn’t get the job done. What worked better for me was to have a weekly list of items that could be done at any time during the week but had to be done by Saturday. I’ve documented the process in my Weekly Cleaning Calendar article. 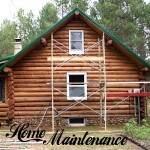 Home maintenance is one of those things that needs to be done but often gets neglected. That can lead to potentially large problems. Below is a home maintenance schedule which you can copy, customize, and subscribe so you’ll never forget and neglect your home. Most of these tasks apply mainly to homeowners, but renters should have a look at some of the important safety reminders. If you don’t already have a maintenance list for your home, you can view my Home Maintenance article. Additionally, the Google Calendar below contains all of the information on that page. Feel free to download it and change it to match your needs. You can download the calendar to avoid reading the article. The Google Calendar embedded below will help you keep your home maintenance tasks organized. Additionally, with Google Calendars, you can share (read here – delegate) tasks or the entire calendar with your significant other or even your kids. This is probably the most personalized section of this article. It’s meant to encourage you to base your schedule around your personal needs. Are you a night owl that likes to sleep in and is most productive in the afternoon and evenings? Are you an early riser that likes to go for a run every morning? Consider outside factors. Are there times that would help you avoid traffic jams? Do your kids have to be up at a certain time? Download the Planning Worksheet here. When do you like to exercise? What do you like to do over lunch? What time of day are you most productive? Do you like to rest on Sunday or is that your get-stuff-done-around-the-house day? If you’re an entrepreneur, are you sluggish on Mondays but getting a lot of work done on Saturdays? Take these preferences into account. Download the Blank Weekly Schedule here and print it out. Use your answers from above to fill out the blank schedule. 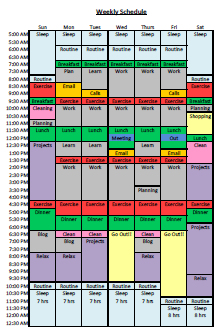 Once you have your weekly schedule all planned out, figure out the best way for you to implement it. Keep a hard copy on your desk or refrigerator. Pick things you need to be reminded of and put it in your online or phone calendar. Some ideas for that would be breaks from work to get up and walk, or a reminder to work on your projects on Saturday afternoon. In the example used above there are several blocks called “Projects”. It’s a good placeholder for things like Home Improvement projects or all of the organization projects like this one and many more to come in the Organized Life Series. Head over to that page for the next project or read the list of upcoming projects. This schedule is based on the Chrononotebook. (Say that 3 times fast!) 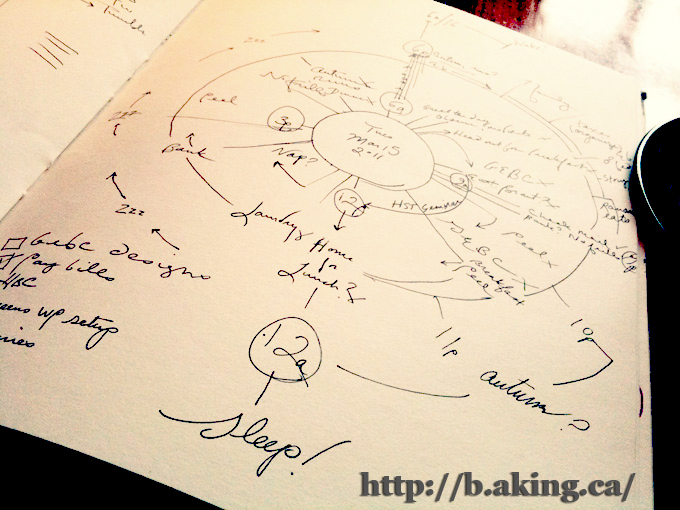 The idea is to create your daily schedule based on the visualization of the clock. A. King begins the day at 6am, so the inner circle is 6am-6pm and the outer circle is from 6pm-12am. That would be happy sleep time. It’s a fun and interesting concept if you’re looking for a different weekly/daily scheduling platform. And it would be fun to post in your office. Another great calendar to have is an Exercise calendar. First, it allows you to block out times to work out so that your calendar shows you as not available. Second, you can use the alarms to remind you to stop working and get up and move around at 2:00 pm. If you need some help planning out a diet and exercise regime, check out my Get Healthy article. 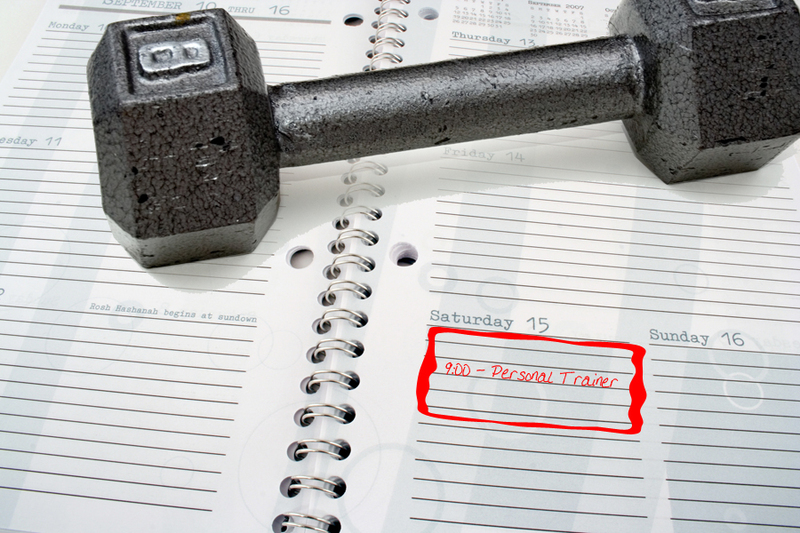 If you’re already set up with a fitness plan, use the instructions from the other sections of this article to create your calendar and set up your notifications. Google Calendars are easy to share. You can have work calendars and personal calendars live together peacefully. You can share one calendar with employees or partners and not another. You can post a busy time schedule on your webpage. It’s only limited to your abilities and imagination.